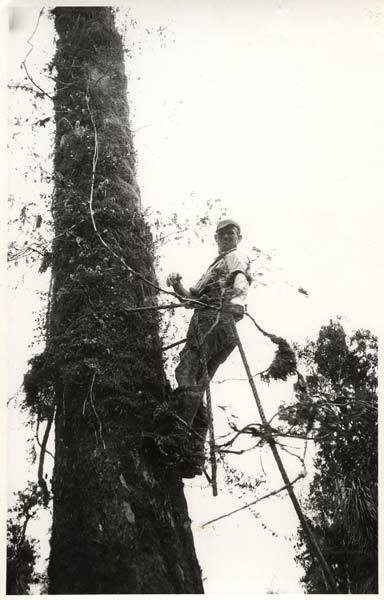 Shelley Bennet spent 40 years working in the bush, and became expert at climbing trees and lopping off branches. But back in 1947, it was a bit of a shock when he met his workmates. Contributed by Shelley Bennet of Greymouth. So it was. I was reasonably young and fit, but not nearly fit enough for bush work. I was in a gang of three cutting a ‘cable’ track. I had to sight three pointed sticks stuck in the ground to get the track straight. It took two days. I asked the boss if I could do the next track and he said ‘Go for it’. Coming from the air force, I still had my compass. The track took me two hours. Then came the abuse: CITY SLICKER, SMART ALEC, etc. Going into the bush, especially on the West Coast, was the best move I had ever made. Great people, great workmates!